and I went to see our village guys on the day of Holi festival to Agchia who were undergoing training program to become security guards. Since it was a holiday in IIT, we caught a bus to the place from Jalukbari at about 11 am. Reaching there, we were surprised to see many guys speaking our tongue housed in bamboo made single-side tin roofed camps. The camp where our guys were staying was bustling with oi nitoms on cell phones and some chit-chatting in slang-mix serious talks. We were welcomed by our boys with non-veg lunch. One cousin of mine quipped, " You guys are lucky that you come today, we have meat curry". We quickly ate the food which was served with two chillies. " Brother, we don't have enough water today", one of them rued complaining about the inadequacies of water supply even to take bath after playing Holi, the colour-soaking festival of India. After lunch, we all sat down in the bamboo made large-rowed bed. They talked about the rules and regulations during the training, of problems and prospects, their aspirations and future in Indian cities. One of the guys older than me from our village, an arts graduate replied me when I asked him why had he come here, " No deal eh! 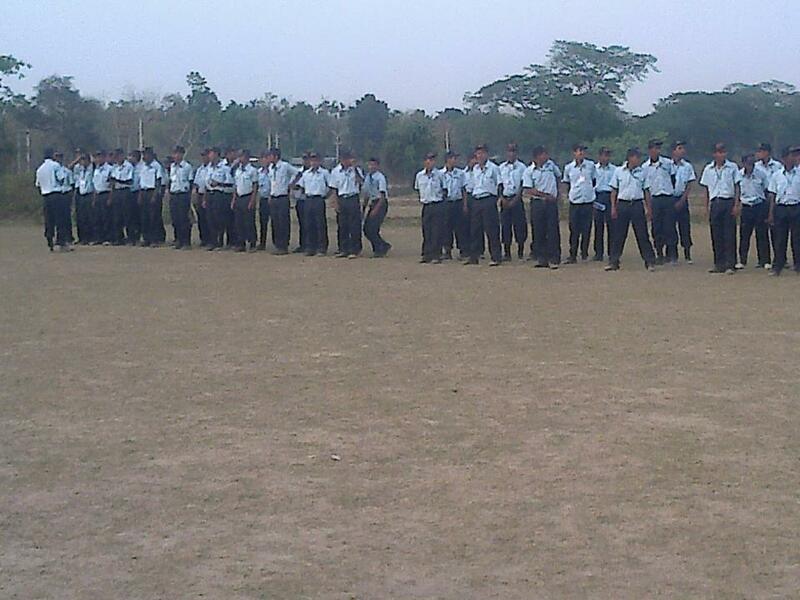 I"ll go to Paresh Baruah (of Ulfa) after completing my training here. We have learned everything now except firing guns!". His nickname is Rabon. During our childhood days, we used to sit in circle at a roadside village ground in the evening and sung hit Adi and Galo songs( "Sai sai sina was one! )clapping like an orchestra. Since our villages lies in the border of Arunachal, we have had natural inclination to learn song and language of the other side. There were many elders in our village who could speak impeccable Galo tongue and used to kid us with new lingo. Rabon was one who once led us introduced to the world of neighbouring cultures. I knew Rabon was kidding about Ulfa and he revealed us later that his elder sister who was recently married off have sent him to attend the government initiated free training program after selling a big swine. " You know my old mom is alone at home now, they are concern about my future so I came here. Otherwise, I would have gone fishing in the ponds today if I were in village". 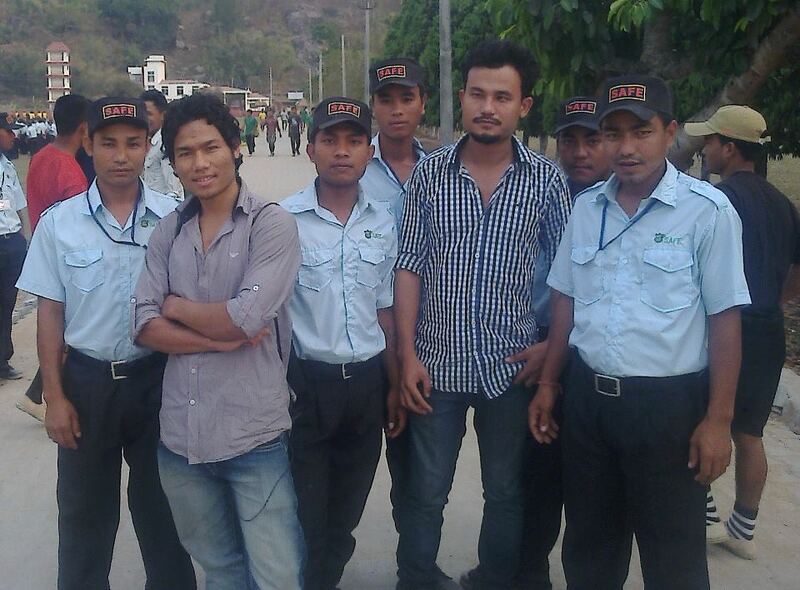 The guys from our place told us that there are highest number of trainees from Dhemaji district. " There is an Assamese guy, you know he is a head master's son from Silapathar and he is a graduate too. His elder brother is also a TET teacher. If a person from his background can come, why not guys like us who have nothing at home". " This is the last ditch attempt to build my life. If I can saved money for an auto-rickshaw after my employment as security guard, I'll return home soon." We discussed many things what others may just consider as crap. From the talk of campus varsity at Jonai to politics: Sixth Schedule, MAC elections, unemployment and nature of village youths. Some younger guys immediately left our crap talks when it was alerted from the threshold that girls were coming. A guy facing towards me said, " Arope biro, ko:neng kangkikuma:nam bojeko idakbo, ngo ka:po:ye!" (Really brother, I have not seen girls for days, I am going out to see!". " I don't know why they are so crazy, can't they have patience for 35 days without seeing girl", one of them mumbled. I know the boys were desperately missing their rural environment here. I asked one of my cousins, "What about your study? Did you left?" " They will let me appear in class 12. My parents have allowed me to come here", he replied. Rabon added that my cousin was having his class 11 exams, he left it and come. Rabon said, " It is good that he join us. Otherwise he have been taking dendrite and grass there. He was narrowly restored from the drug gang. All sorts of intoxicant stuffs have ruined our village boys these days. Those who have stayed back are doing nothing except playing cards, drinking and bringing bride. At village, you know you ate your food and wander without work whole day. Here at least, government is providing everything from food to uniforms, we are learning something for our lives too". 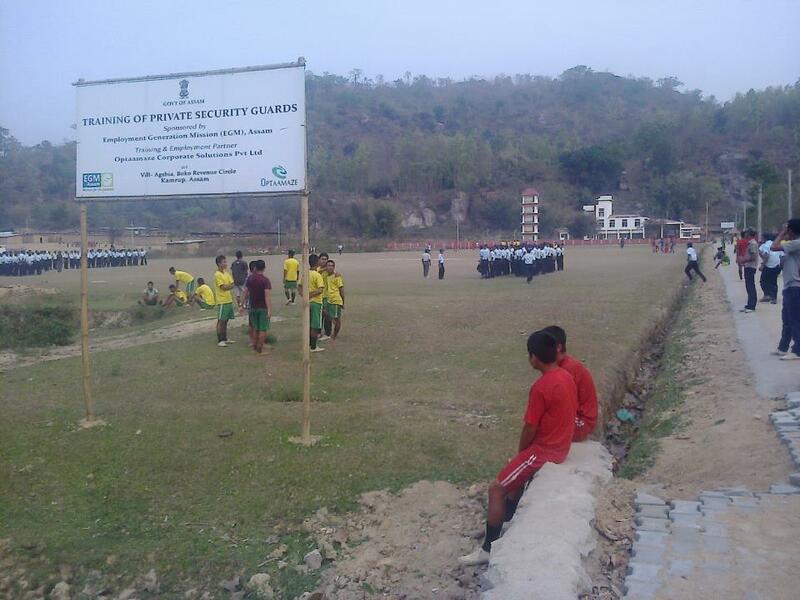 More than four hundred youths from various districts of rural Assam are undergoing training program for private security guard under the aegis of government of Assam's Employment Generation Mission at Agchia, about 35 kms from Guwahati. The training program is provided free of cost for 35 days which includes physical fitness, discipline and regulation, fire fighting techniques etc. They are being trained by ex-Indian army. The initiative is taken by government of Assam in order to minimize burgeoning unemployment in the state. The minimum education qualification to join this program is matriculation. enterprenuership,somehow the solution to unemployment?. but somehow i wonder, who will take the initiative first?